The new LDH-1.7 Linear Digital High speed InGaAs Camera increases line rates for 1024 pixels to over 46,000 lines per second for spectraldomain optical coherence tomography (SD-OCT), NIR spectroscopy and machine vision. This versatile LDH-1.7 Linear Digital High speed InGaAs Camera provides 14-bit digital capture into base format Camera Link® interface cards. It utilizes the new LC series of linear arrays, which feature double-sampling, integrate-whileread acquisition and low noise, delivering the high dynamic range demanded by these applications. 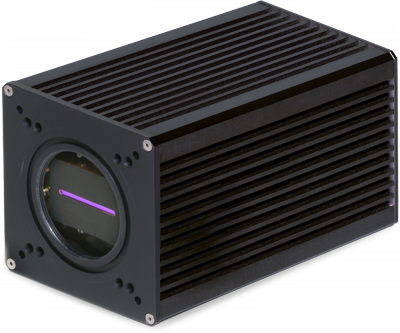 The camera is available with 500 μm tall pixels for easy alignment in SD-OCT systems, or square 25 μm pixels for high-time resolution machine vision or for PS-OCT.
1Cameras include the photodiode array – see the array datasheet for array specific performance specifications such as dark current. 2Accessory Kits: Include power supply, case, manual, o-ring, cables and are available that consist of the user-specified lens adapter.